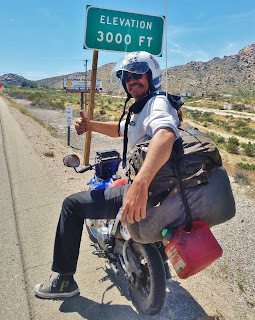 Waking up in Calexico, we had about 130 miles to get to San Diego. I pulled what I thought was a new tube from my bag and changed it out my front tire. I even used the C02 cartridges that The Old Bastards m/c gave us at the Payson fundraiser. Problem was, it wasn't a new tube. It had a pin hole and was flat before we left town. I had ride a flat there so I decided I was done fixing flats and rode it all day. I figured this would keep my speed down. My front bearings were also going out and were making sounds like an angry rattlesnake. Going from sea level up over 3000 ft of hills I thought would be the challenge. what I forgot was what goes up, must come down. 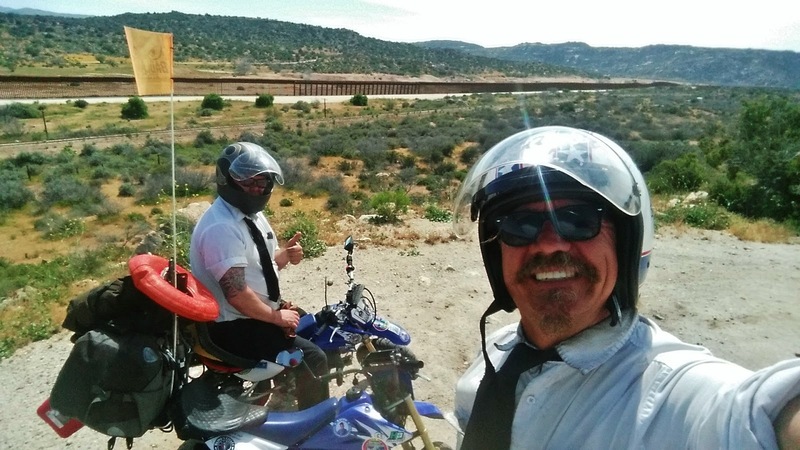 The down hill twisty canyon roads were sketchy. If I leaned in the turns, my front tire wanted to wash out. I knew if I ever got it to jump the bead, I would really be doomed. Still, we made pretty good time and kept moving forward. Most of the way we were right beside the border. Here you can see the wall. It's not a good wall. I know walls. Believe me, I could build a better wall. I'm not going to tell you how, but you'll see... and it's going to be great. The entire day we saw more Immigration official in the SUV's. We even went through a few check points again. There was also a lot of signs telling us that human smuggling was a felony. For that reason, we didn't pick up any hitch hikers. As we got closer to our destination, it looked like it was smooth sailing. My front tire was getting really warm and felt like it was going to wash out from under me and any second so I stopped to let it cool. Traffic had picked up in the canyon roads too and there was very little shoulder to ride on. We rested for awhile and then I took off down a mountain grade. Tim was behind me but I lost him. I went back and he had went over the handlebars. They were badly bent too. I was concerned until he rolled up his pants leg he had a little owwie that looked like it needed a Strawberry Shortcake Bandaide on his "compound fracture". I ribbed him for the rest of the day and I guess karma had enough and less than a mile from our good friend, Pat's house. 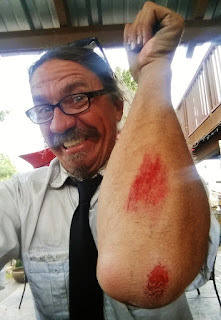 the front end came out from under me and I went skidding down the street. Tim got the pleasure of watching. I was just happy that he didn't run over me when I came to a stop. Now the finish line for us is 25 miles away. It is at Waterfront Park in downtown San Diego. We will be there at noon with the TV news waiting. Come see us!!! 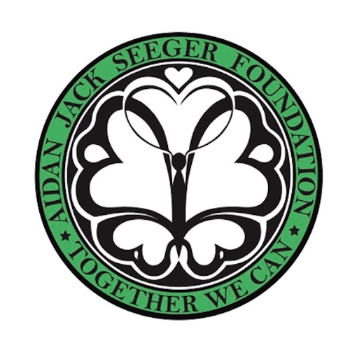 And don't forget to check out The Aidan Jack Seeger Foundation page at http://www.aidanhasaposse.org/ and please contribute to their cause on this link. You just might win some great prizes too!!!!! Get a tee shirt patches and stickers or raffle tickets today. Click here!!!!!!! You guys have done it! So happy to have been a small part of it....ride on brothers and take a well deserved break. Woohoo! What a great read on your epic road trip. Thanks for the opportunity to learn about ALD.